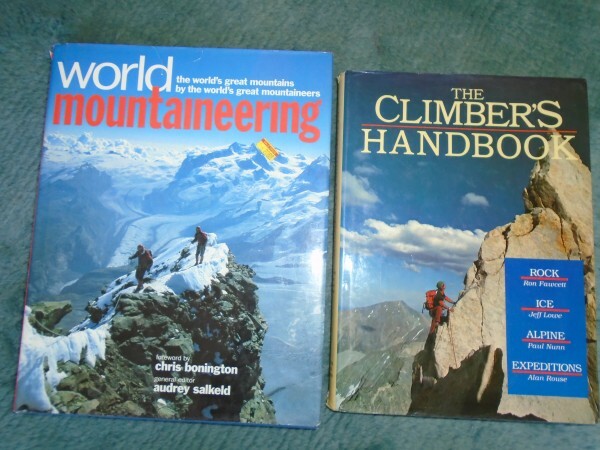 I was clearing out bookshelf space and decided to give up some old climbing books. If you want some, let me know and pay the postage! 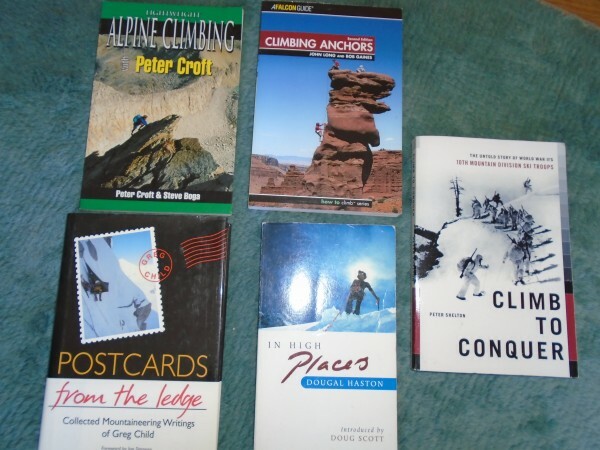 Why is a book by Peter Croft - named Lightweight Alpine Climbing - with a picture of him free soloing on the cover - so funny? I never knew this book existed. I'd be interested in the Dougal Haston book. Postcards from the Edge by Greg Child is a good read; someone should snap that up if they haven't read it. Johntp and tanslacks - they are yours. Check your email. 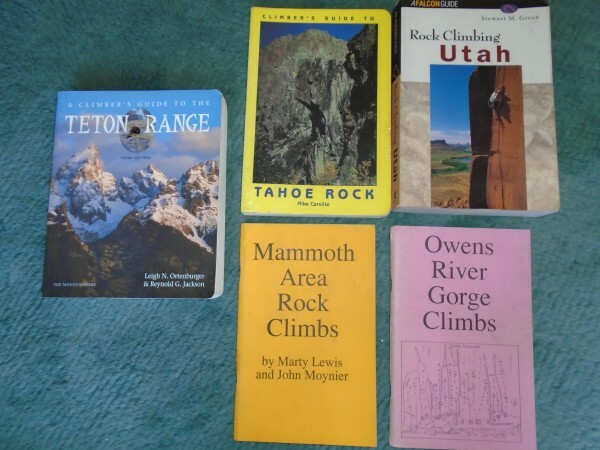 If it's not too greedy I'd love the Cosumnes, Tahoe, and Mammoth guides. If it is too greedy I've listed them in my order of preference. Either way, thanks in advance. meatplanet at yahoo dot com. Table mountain will find a good home with me. I already have one if there is needing soul out there. Rock n Road. For my Retirement Plan. Got it. Thanks again for your generosity. I've replied to your email. Thanks. If you want any, email me at mbrunningman at yahoo dot com. You can get them for just the postage. 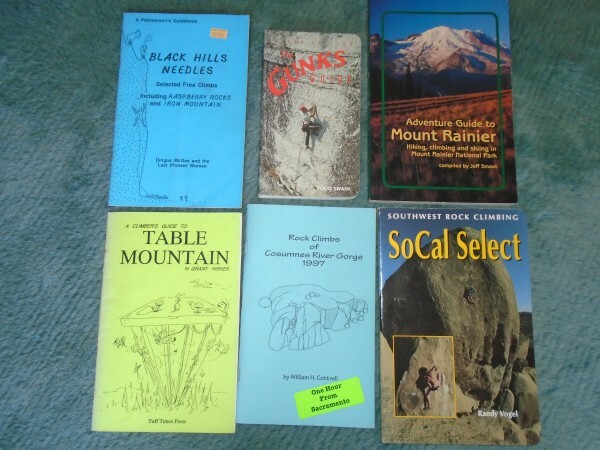 Are you still climbing, running, and MTBing? hey there, say, climbrunride... wow, what a sweet thing to do! Climbrunride, Nicely done, dude. One of these days I will also need to do a literary purge and I think I will follow your lead. Very cool! cragnshag - Yes, of course. But not running as much, due to too many knee surgeries from skiing accidents. 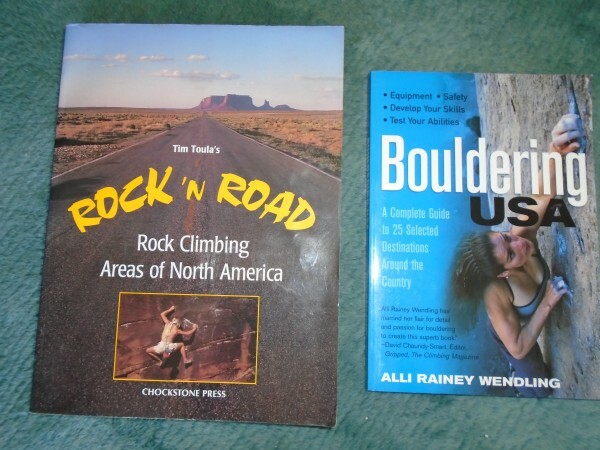 I'll be out in CA in June, if you want to go climbing or riding, or just have dinner and a beer. Munge - I need your address so I can send it to you. Flip Flop - you too. You can email me at mbrunningman at yahoo dot com.